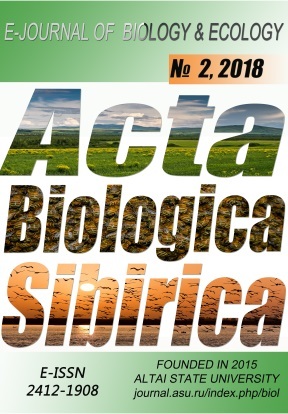 There are 40 spider species from 13 families were collected by the Barber pitfall traps in the steppe ravine in Osokorovka Village (Novovorontsovsky District, Kherson Region, Ukraine). The maximal species richness registered for the families Gnaphosidae (14 species), Lycosidae (10 species) and Thomisidae (7 species). A biotope in the bottom of the ravine was characterized by the maximal species richness, the maximal number of specific species and the maximal dynamic density. This biotope serves as a refuge for mesophilous species. The spider community composition in this biotope was significantly different from surrounding steppe habitats. Arnoldy, К. V. (1956). An outline of entomofauna and characteristics of entomocomplexes of forest litter in the region of Derkul. Trudy Instituta lesa, 30, 279-342 (in Russian). Belgard, А. L. (1971). Steppe forestry. Moscow. Lesnaya promyshlennost (in Russian). Polchaninova, N. Yu. (2009). Fauna and spider population of the Potiivsky area of the Black Sea Biosphere Reserve (Kherson Region, Ukraine). Readings of the memory of A. P. Krapivnyi. Materials of the International scientific Conference (Deсember 4-5, Kharkov, 2009), 61-71 (in Russian). Polchaninova, N. Yu., & Prokopenko, E. V. (2013). Catalogue of the spiders (Arachnida, Aranei) of Left-Bank Ukraine. Arthropoda Selecta, Supplement 2. M.: KMK Scientific Press Ltd., 1-268. Polchaninova, N. Yu., & Prokopenko, E. V. (2017). Catalogue of the spiders (Arachnida, Aranei) of Left-Bank Ukraine. Addendum 1. 2013 – 2016. Arthropoda Selecta, Supplement 4. Moscow. KMK Scientific Press Ltd., 1-115. Prokopenko, Е. V., & Zhukov, A. V. (2009). Structure of spider population (Araneae) of the birch forests of Dnipropetrovsk Region. Problems of ecology and nature protection of the technogenic region. Donetsk: DonNU, 9, 124-130 (in Russian). Savchenko, G. A., & Ronkin, V. I. (2006). Effect of primary and induced heterogeneity for the complexity of steppe ecosystem in the North-eastern Ukraine. Materials of the scientific conference of the biological faculty of Kharkov National University named after V. N. Karazin, dedicated to the 100th anniversary of G. I. Semenenko, 3(729), 185-192 (in Russian).